Bob Dylan performed ‘The Night We Called It a Day’ on the penultimate episode of David Letterman’s show last night, Tuesday 19th May. This rare television performance was Dylan’s first on the Late Show for 22 years. 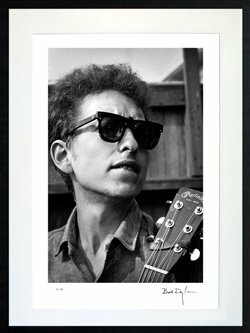 Just three signed prints remain in Dylan’s BEHIND THE PICTURE FRAME series. Jim Marshall’s photographs capture some of Dylan’s other legendary moments: in Greenwich Village, at Newport Folk Festival (pictured left) and during the making of The Freewheelin' Bob Dylan. Click here to secure yours today.